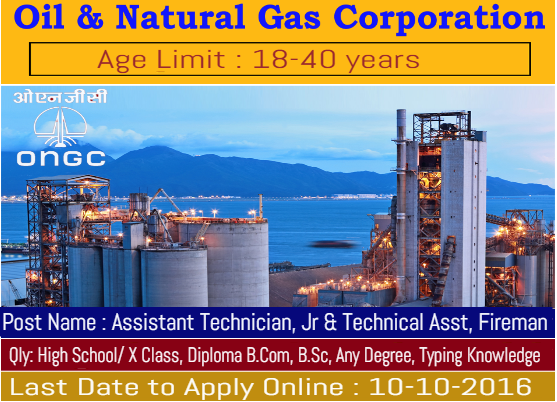 Are you looking for ONGC company jobs? ONGC recruitment notification 2015 has released now. Want to apply for it? Now check it below. Age Limit : 18-40 years as on 10-10-2016 .Age relaxation is applicable for SC/ ST/ OBC candidates as per rules. proficiency in typing 30 w.p.m. with Certificate/Diploma / B.Com., with proficiency in typing 30 w.p.m and Certificate/Diploma / Graduate with Typing speed 30 w.p.m. Certificate/Diploma of minimum duration of six months in Computer Applications in the office environment. Post Graduate Degree in Chemistry. Process candidates Selected based On Written Test / Academic Performance . How to Apply: Eligible candidates can apply Online through website www.ongcindia.com . Procedure: Eligible candidates may apply online through the website www.ongcindia.com from 03-07-2015 to 24-07-2015.